Starting on Monday, March 11, the National Park Service will reduce the number of lanes that drivers can access from 9 p.m. until 5 a.m., the park service said in a news release. The new traffic pattern will involve workers closing one of the bridge’s three open lanes for several hours at a time and temporarily closing an additional lane for about 15 minutes at a time, the park service said. During the 15-minute periods when only one travel lane will be open, flaggers will direct traffic, intermittently stopping drivers to allow one-way travel in the open lane while workers install a new surface on the bridge. This will allow room for workers to install large, precast concrete panels. The panels require space to be loaded onto the bridge and lifted into place with a crane, the park service said. During the construction, the bridge’s sidewalk will remain open; the work will not affect pedestrians or bicyclists. Drivers who use the bridge during the day will continue as they have since construction began in October, with one lane always open east and one lane always open west with a reversible lane to accommodate rush hour traffic. The reversible lane switches direction at noon every weekday, except federal holidays. The park service anticipates that the next change for drivers, pedestrians and bicyclists will be in the fall, when work will be shifted to the other side of Arlington Memorial Bridge. 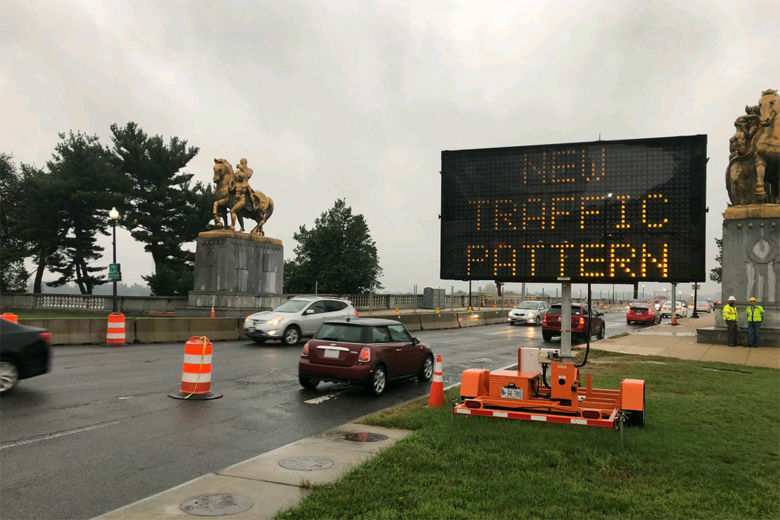 Changes to traffic patterns will be posted on the Arlington Memorial Bridge section of the National Park Service’s website.